Nebraska – a land of astounding natural beauty. 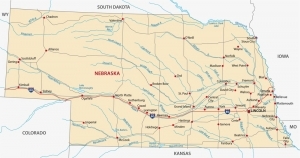 Nebraska is sandwiched between the Great Plains and the Midwestern United States. Bordered by South Dakota, Colorado, Wyoming, Missouri, Kansas, and Iowa, Nebraska was home to the indigenous people of Omaha, Missouria, Ponca, Pawnee, Otoe, and various others. Nebraska has a rich history of being crossed by many trails and being part of the Lewis and Clarke Expedition. A Nebraskan claimed the first grant for a homestead in the year 1862, and this made the travelers who came westward to halt and stay and settle in this wondrous and fertile land to build and grow some of America’s best farms and products. People of Nebraska are basking in the glow of a high standard of living where cities, farms, education and almost everything go hand in hand with each other. From Lincoln to Bartley, Nebraska has everything you seek. So don’t hesitate and just start moving! Do you like Nebraska? Share your passion! Check on the Nebraska Department of Roads for any construction work on roads. If you’ve got no other option, ensure you take all the necessary precautions to ensure a smooth move-in, like a fully charged cell, toolbox, first-aid kit, provisions, etc. Always be ahead of time if you are going to be moving to the larger cities because they have plenty of traffic. Find the closest storage – you might need it. Read our advice if you are uncertain what to choose: Truck Rental or Professional Mover? If you decided to go with a moving company, read this advice: 5 things to avoid when hiring moving company. Nebraska has two major climatic zones. The eastern part features a humid continental climate, and the West has a semi-arid climate. Nebraska usually undergoes various changes in temperature and precipitation throughout the seasons. Nebraska has stable average temperatures with cold winters and hot summers. Nebraska experiences approximately 31.5 inches of rain annually. The humidity of the Nebraskan climate shows a significant reduction from east to west. Be aware of storms because Nebraska is part of the Tornado Alley and is prone to heavy thunderstorms and tornadoes during spring and summer and also sometimes during autumn. Nebraska also experiences the chinook winds from the Rocky Mountains which provide a temporary regulating effect on the temperatures in western Nebraska during the winter season. 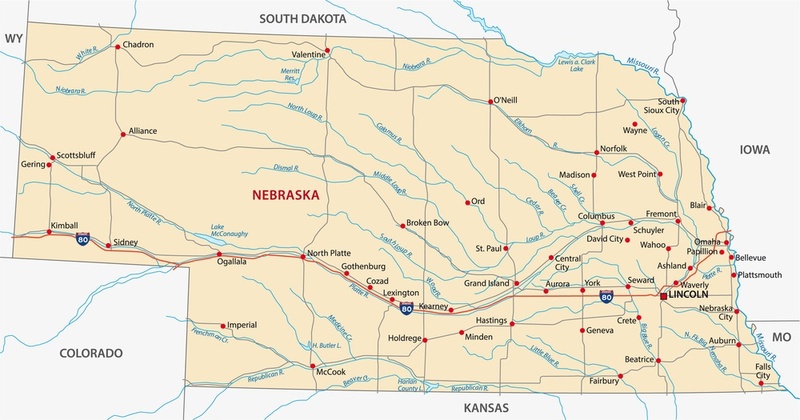 As of the 2010 statistical estimates, Nebraska has 530 cities and villages in total. The cities and villages are classed into five categories. The largest cities are Omaha and Lincoln with population estimates of 434,353 and 268,738 respectively. Omaha is a metropolitan class city while Lincoln is a primary class city. First class cities have populations between 5,000 and 99,999 people, some of which are; Bellevue, Kearney, Grand Island, Fremont, Hastings, North Platte, Sidney and much more. Second class cities have between 800 and 4,999 people, and villages have between 100 and 800 people. There are 116 second-class cities and 382 villages in Nebraska. High Schools: Dodge High School, Junior/Senior High School, Palmyra, Pender High School. Nebraska also has a collection of excellent community colleges which give students many options to choose from. There are also a good bunch of private colleges and universities like the Bellevue University, Concordia University, Christian college and much more. Though Nebraska is not widely famous of haute cuisine, the Cornhuskers do know a good deal of homemade delicacies to make your taste buds scream with joy. Here are 12 iconic dishes which you’ll never find elsewhere. If you like locally grown fresh food, check out these farmer markets in Nebraska. Kool-Aid: did you know Nebraskans invented this? Transport by rail existed in Nebraska since the 1860s. The Union Pacific Railroad has its headquarters in Omaha and was established on the 1st of July 1964. The other main railroads are Arm Track, BSNF, Canadian Pacific Railway and Iowa Interstate Rail. The Nebraska Department of Roads maintains a system of state highways. Each distinct part of the motorway is assigned a number, a State Highway Number. There are six commercial airports in Nebraska: 5 primaries and one non-primary; Grand Island, Kearney, Lincoln, Omaha, Scottsbluff and North Platte. Nebraska has an average household income of $42,166 per year. But the best part is, the cost of living in Nebraska is almost 22% lower than the average US price. This is due to the abundance of land and low population density. Also, the crops and meat are produced locally, so there’s no need for transportation costs. Even the gas prices are pretty high; the average person commutes for only 18 minutes. Moreover, Nebraska is a pioneer in green energy sources, and the Cornhuskers use water and ethanol as an alternative to fossil fuels for industrial buildings. As the statistics say, the average family with children spends 30% of their household income on their kid’s education. This is a definite sign that the quality of education in Nebraska is top-notch. 2.46% on the first $3,050 of taxable income. 3.51% on taxable income between $3,051 and $18,280. 5.01% on taxable income between $18,281 and $29,460. 5.84% on taxable income of $29,461 and above. 2.46% on the first $6,090 of taxable income. 3.51% on taxable income between $6,091 and $36,570. 5.01% on taxable income between $36,571 and $58,920. 6.84% on taxable income of $58,921 and above. The tax returns of the state are due on the 15th of April or the following working day if that day is a weekend or a holiday. Nebraska has one of the highest property tax rates in the US. The average effective tax rate is 1.88% which secures its place as the 6th highest rate in the country. In some of the large Nebraskan counties, the rate is sometimes as high as 2%. Property taxes in Nebraska can be paid in two installments. The first half can be paid by the first of May and the second half by the first of September. In some counties, the dates are April 1st and August 1st. The market value is assessed by the county offices annually on the first of January. You have 30 days to make complaints if you have any to the County Board. In the year 2004, Nebraska had 4.8% of its population as foreign-born residents. There are five major ancestry groups in the state which consist of 38.6% German, 12.4% Irish, 9.6% English, 8.7% Mexican and 5.5% Czech. Nebraska has the most number of Czech-Americans and Danish non-Mormons. People with German ancestry are mainly found here in the eastern counties. Apply for an NE Driver’s license within 30 days of arrival; it costs $10 to transfer a title and $7 to record a lien on your vehicle. Additionally, the VIN inspection will cost another $10. Register your vehicle at the local county clerk’s office within 90 days of moving. Perform an emissions test as well. Register to vote ASAP using the license or any identification certificate. Check your trash and recycling methods, and if you live away from the city, you might have to find a waste management company.